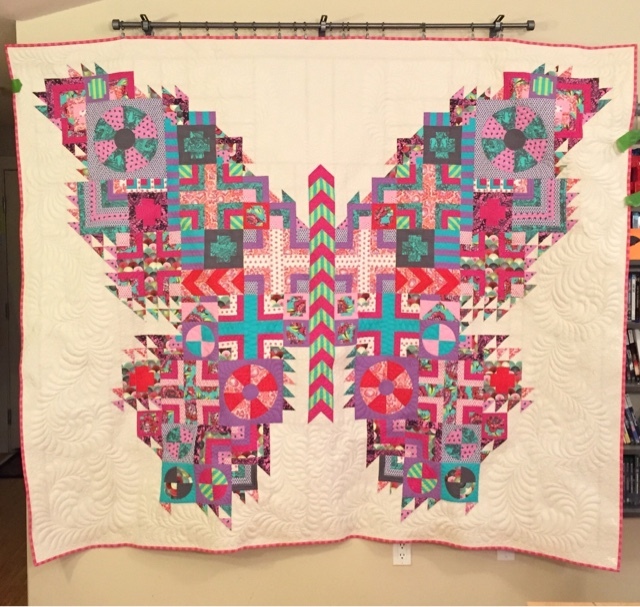 When I first saw the pattern for The Butterfly Quilt, I remember thinking that it was pretty cool, but it wasn't until Sew Expo in March of 2014 that I actually purchased it. I was super fortunate to buy it and have it signed by its creator (and my favorite fabric designer), Tula Pink. To be honest, I wasn't sure when or if I would make it, but something about it resonated with me. Now, fast forward to late 2014 and the debut of Tula Pink's Elizabeth collection. Less than a minute after seeing the images of the fabric for the first time, I knew that I had to make The Butterfly Quilt using Elizabeth and coordinating solids. I also knew that I would need the help of my wonderful friend and longarm quilter, Teresa Silva of Quilting is my Bliss to help the butterfly take flight with her amazing quilting. So, I asked her to add me to her schedule for May 2015 (this was booked in very early November 2014) which would give me 2 months to get the fabric and to have it ready for my scheduled time slot. The wait between the collection's October Quilt Market debut and the scheduled release of March 2015 felt like an eternity, but it wasn't as if I didn't have any other projects. I also had a trip to Texas for QuiltCon on the horizon. With the remainder of 2014 and first two months of 2015 gone in the blink of an eye, I returned from my trip and got cracking on turning a pile of fabric into the quilt that I envisioned. This beauty is way too big for my design wall (and the physical wall too), so just pretend the painters tape isn't there. Looks can be deceiving. 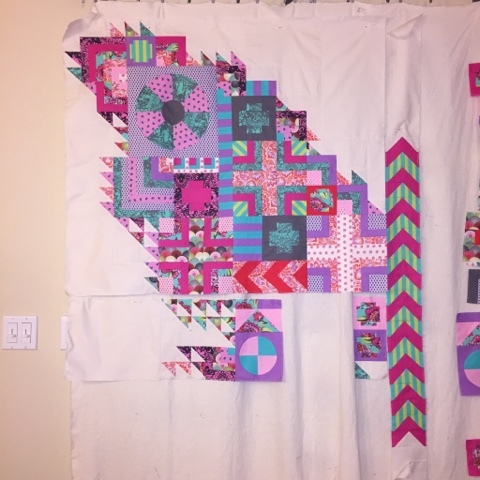 When I first saw the pattern, I thought there was no way that I would make a quilt that used so many different blocks. As I mentioned in the backstory, I bought because I could have Tula sign it. When I got it home, I decided that I would actually look at the pattern, and I was more than happily surprised to discover that the quilt was nowhere near as complex as I had feared/dreaded/imagined. This is one of the first pictures that I took of the quilt. It is early enough in the process that I was using the right side of the center spine to hold the extra blocks. It's starting to come together and look more like a butterfly after completing part of the wing. It's really just 15 different blocks (not really even that many because there are several sizes of log cabin blocks, for example). The key to making it look quite complex is that blocks are done in mirror images (left wing vs right wing) and different color combinations are used. Wow. Tula is a mad scientist, evil genius, she's the (wo)man behind the curtain in Pinkerville (kinda like Oz but way more awesome), and just downright brilliant (plus she's actually super nice and funny in person). The pattern is well written and the diagrams for planning and assembling the quilt are incredibly helpful. With the exception of the wheel/pie/round blocks, I had no issues with any of the blocks. I've made quilts with curves without issues on several occasions (4 specific quilts come to mind), and I've done curves too. The curves in the blocks on this pattern are steep which make them more difficult. I had to fight with mine quite a bit and load them up with a ton of Best Press (a starch alternative), but they came out still looking like circles. It certainly can't hurt that I requested that Teresa "quilt the hell out of them" to keep them flat. Other than the blocks with the curves, the biggest challenge for me was picking fabric. I knew that I wasn't going to use the full collection, but I didn't know exactly how much I would need of each print or how many prints I would really use. 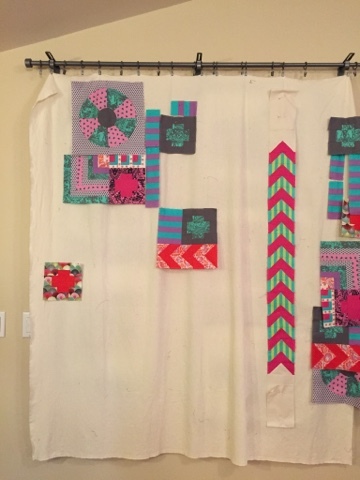 Thankfully, I had purchased enough fabric of the whole collection so that I could tackle the blocks as the came up. I didn't work through the pattern in order (I did read it all first - several times, in fact). The first section that I finished was the flying geese that form the center spine of the butterfly. For the most part, I worked in sections. I would make one of the larger blocks in the section and work outward from there so I would get a feeling on which colors/fabrics to use in the neighboring blocks. In the end, I think I actually scrapped one block that I had made because it just didn't seem to fit after I surrounded it. Oh well. It happens sometimes. For the most part, everything went smoothly. My sections joined up with their neighbors, and they fit together perfectly time and time again (yay)! While I did make some changes, the changes wouldn't impact the blocks of the butterfly. I don't have a queen size bed, and I didn't want to modify it so that it would fit my king size bed. Would you believe that I saw the answer when I went to Teresa's house to pick up another quilt she did for me? Her Butterfly Quilt is hanging on a wall. That was the answer, unfortunately, my house isn't set up to handle such a large quilt. Most of our walls have large things that can't be easily moved like windows, wall heaters, thermostats, and fireplaces. So, I am saving the quilt for a future home where it can be displayed. Knowing that it would be for a wall hanging, I opted to modify the borders. The original pattern has very wide 11" finished border on top and bottom only. I elected to change it to 3" all the way around the quilt, and I used the same fabric as the background of the quilt. My decision to add a border on the side was to create a little extra space between the binding and the tips of the wings. My binding was going to be quite bold in color and style, and I didn't want to feel like it was encroaching on the central element of the quilt. Once it was finished, I sent it off to Teresa. For the record, I am not an entirely trusting person, but she just gets me (scary thought, isn't it, Teresa??). I trust that she won't turn out poor quality work because that's part of who she is. She's also a Tula junkie, and she would never "disrespect the Tula" as I like to say. We make a pretty good team. Teresa has quilted this quilt on several occasions that I really liked, but she knows she has the freedom to switch things up a bit and experiment with different motifs on my quilts (like the spiral on some of the blocks with circles). Anyway, she blew my mind. It's perfect. I couldn't have dreamed that it could be any better. Now, I just need to find the right house for my perfect quilt. Until then, I open up the closet where it hangs and I pet it frequently. I'm planning to enter it into to show hosted by one of the local quilt guilds. I'll have more information on that later. For now, you can read the blog entry from Teresa that has some additional pictures. So, yes. If you have the opportunity to see this quilt, you should. Get up close and really look at it. Now that you know the secret, can you see the pieces falling into place? It's an amazing pattern, and I think it's worthwhile to buy if you are remotely curious to see how it all goes together. The debut of Tula's Eden collection at Spring Quilt Market 2015 showed a re-imagined version of the pattern that was dubbed the Eden Moth as Tula selected fabrics to give it a more subtle effect. No matter how you choose to colorize your Butterfly Quilt, it's sure to be a stunner. I bought the pattern and fabric when it came out. Hopefully I have extra. It's been wonderful watching this come to fruition. Can't wait to see it in a show. I so enjoyed working on this project and working with you Leslie. I do appreciate the freedom and trust you give me to just go with the flow and quilt with my heart! It's been so fun to actuallly become friends with you during all of our collaborations. I enjoyed working on this quilt so much! Thank you!